Some bands are just made to play in grungy, grimey, dirty, spit-on-the-floor kind of bars. Quatre Tete is just one such band. The Chicago based trio’s newest album, Art of the State, oozes as much smoke, booze, sweat, stink, and beauty as the ninety year old bar rat sitting next to you. Art of the State is a manic, punk-influenced rock album, designed to leave you on edge and wanting to hurl your desk chair out your bedroom window. 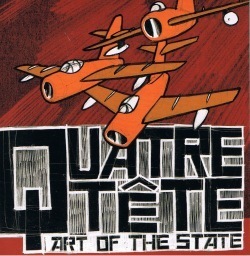 Recorded by the famed Steve Albini, Quatre Tete rocks with a musical efficiency resembling the fine-tuned musical machine Fugazi. A barrage of punk rock that flashes between intrically planned outbursts and near treads into the murky waters of prog-rock that joltingly vault back into the more standard waters of the three chord punk rock riff. It is the willingness to make that jump to and fro that makes Quatre Tete fit for that grimey bar. Not that you have to be drunk to listen to Art of the State by any means, but you need to be prepared for some abrupt changes, and a few beers makes those changes easier to take. But where most bands fall into the tried and true method of something that sounds good, Quatre Tete start with something starting muddy and dirty and try to make something beautiful out of it. The brand of rock isn’t exactly beautiful by any means, but it is some good, not-so-clean fun.